Reinforced synthetic base stock provides very high lubricating power. Ensures resistance to very high temperatures reached in modern engines. 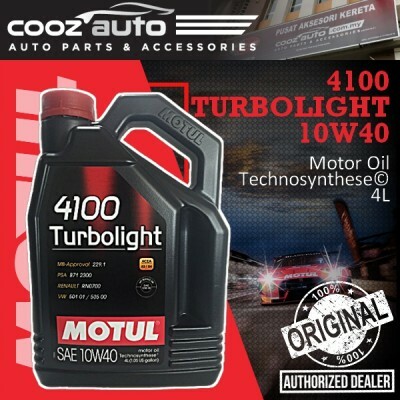 Motul 4100 Turbolight 10W40 is a Technosynthese engine lubricant specially designed for powerful and recent cars, powered by large displacement gasoline and diesel engines whether naturally aspirated or turbocharged, indirect or direct injection, carburator or injection, with or without catalytic converter. Suitable for all types of fuels: leaded or unleaded gasoline, ethanol, LPG, diesel and biofuels. Compatible with catalytic converters.